Windows 10 PCs can now send files, links, photos, and more to nearby PCs over Bluetooth. This “Nearby Sharing” or “Near Share” feature works a lot like Apple’s AirDrop, and it’s new in the April 2018 Update. For now, Nearby Sharing only works between two Windows 10 PCs that have the feature enabled. You can’t yet share from mobile or other operating systems. 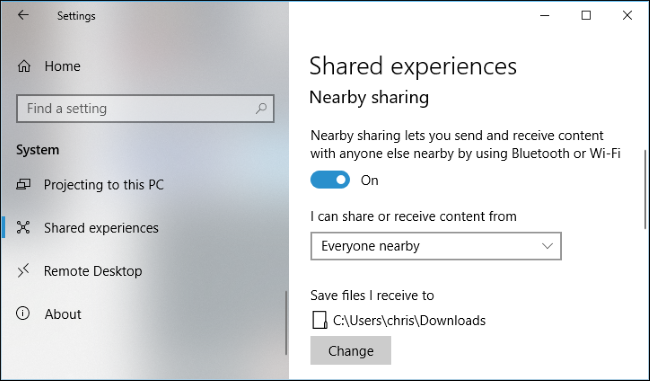 You can enable Nearby Sharing from either Windows 10’s Share dialog, or in Windows 10’s Settings app. 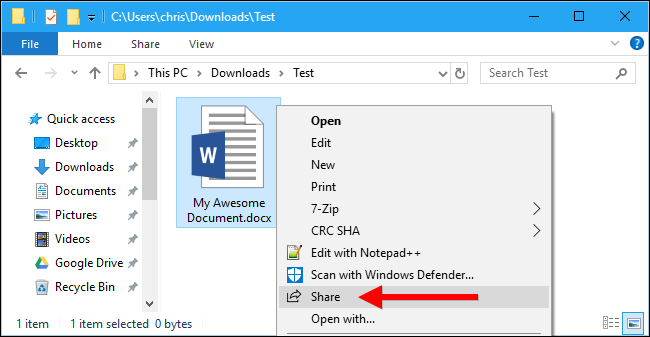 To enable it from the Share dialog, click a “Share” button anywhere in Windows—for example, by clicking the “Share” button on Edge’s toolbar or by right-clicking a file in File Explorer and selecting the “Share” command. In the Share menu, click or tap the “Tap to turn on nearby sharing” option. To enable and configure Nearby Sharing from the Settings app, head to Settings > System > Shared Experiences and turn on the “Nearby Sharing” toggle. Files you receive via Nearby Sharing are saved to your Downloads folder by default, but you can change that in the Settings app. You can also choose who can share with you. By default, every nearby Windows 10 PC can share or receive from you. If you select the “My Devices Only” option instead, Nearby Sharing will only work between PCs you’ve signed into with the same Microsoft account. You can use Nearby Sharing to send files between PCs wirelessly. To do this, open File Explorer, right-click a file, and select the “Share” command. The Share dialog appears and looks for nearby devices. If no devices appear, ensure the other PC with which you want to share has Nearby Sharing enabled and is powered on. When you see the name of the PC with which you want to share the file, click or tap it. You also can change your computer’s name to something more memorable in this dialog, if you want. You’ll see a “Sharing to [PC name]” notification while your PC is waiting for the other PC to accept the share request. A notification appear on the other PC, too—both near the taskbar and in the Action Center. To open the Action Center, either click the notification bubble icon at the bottom right corner of your screen or press Windows+A on your keyboard. Click “Save” to save the file to the PC or “Save & Open” to save it and immediately open the file. The sending PC will then transfer the file to the receiving PC. The process may take some time, depending on the size of the file and the speed of the Bluetooth connection. This same sharing process works with other types of content, too. It works anywhere there’s a Windows 10 Share button. For example, you can share a link in Microsoft Edge with another PC. 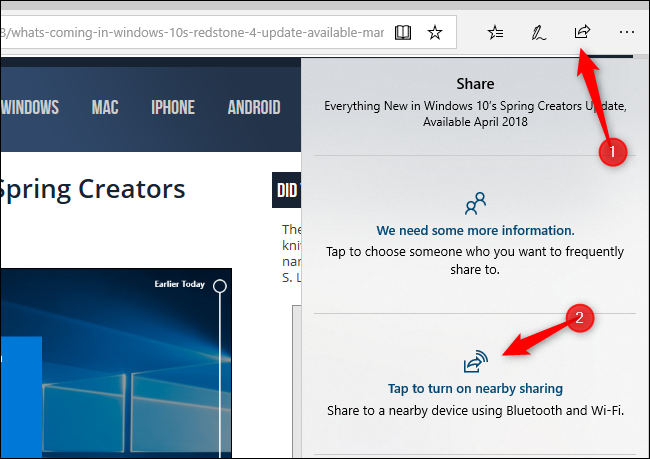 Just open Microsoft Edge, navigate to the web page you want to share, and then click or tap the “Share” button on the toolbar. Choose the other PC with which you want to share the link. A notification appears on the other PC. 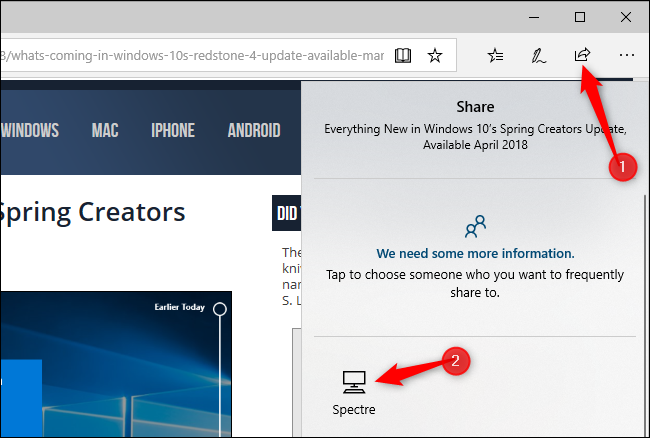 Click the “Open” button to open the shared link in Microsoft Edge. 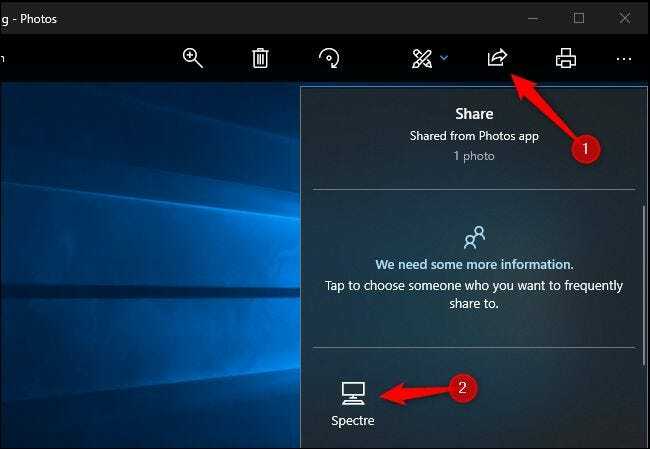 The Photos app in Windows 10 also has a Share button, so you can open one or more photos in the Photos app and use Nearby Sharing to send photos between PCs in the same way. There’s currently no mobile companion app for iPhones, iPads, or Android phones, so you can’t use Nearby Sharing to share data with a non-Windows device. However, you can use the Continue on PC feature to send links from your phone or tablet to your Windows PC.